What to do if you have a client who owes you money, but you can no longer get hold of them? Someone who owes you money and has ‘disappeared’? Well Tracing is a sort of magic on its own. With debtors defaulting on their payments on the rise tracing is the ideal solution if you are searching for a debtor in order to collect monies due. A trace is when you download a report on someone to see if there are any updated information. What information does a tracer need in order to perform a trace? A trace can be done by simply providing the last know cell number, company name, individual name and surname, last known address or even ID number/registration number respectively. Or all of the above. Which tracing systems are used? Traceps, CIPC, EXPERIAN, XDS, and TransUnion are simple, yet powerful systems that allows you the opportunity to pre-vet individuals and trace the relevant information. 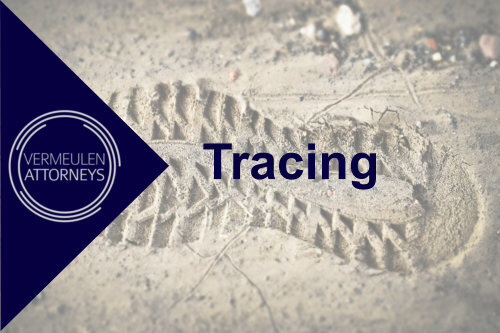 These are the systems most tracing agents use when trying to locate a debtor. What kind of information can I get from a trace? Typically tracing agents can charge you anywhere from R200.00 depending on the information required. However, it is important to note that the PoPI act does make provision for protecting personal information. In simple terms, the purpose of the PoPI Act is to ensure that all South African institutions conduct themselves in a responsible manner when collecting, processing, storing and sharing another entity’s personal information by holding them accountable should they abuse or compromise your personal information in any way. The PoPI legislation basically considers your personal information to be “precious goods”.